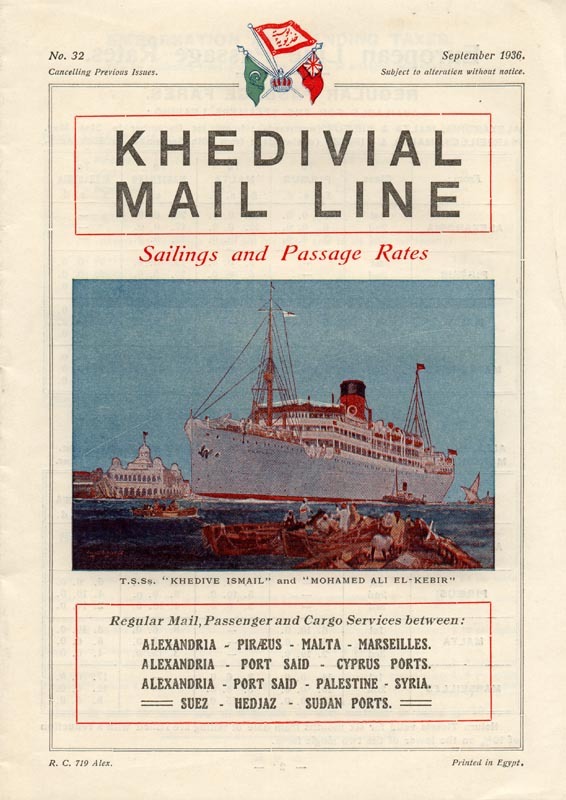 Home / CRUISING THE PAST / Khedivial Mail Line once operated service between Egypt and New York. 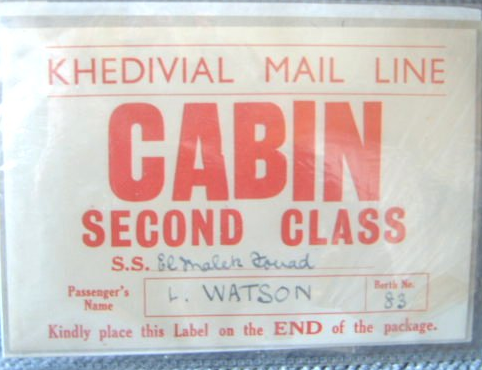 Khedivial Mail Line once operated service between Egypt and New York. 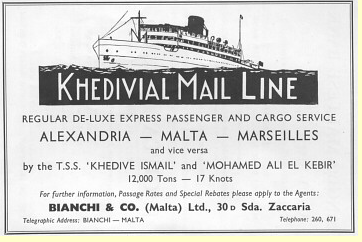 Khedivial Mail Line once operated service between Egypt and New York. As history records the event in Cairo… here is a blog on Egypt’s once excellent trans-Atlantic steamship service. The original name of the company is unknown but it is thought that it was founded in 1858. The Khedivial Mail Steamship & Graving Dock Co. was formed in 1898 to operate ships and docks owned by various departments of the Egyptian Government, but little is known of the early years of the company or it’s ships. 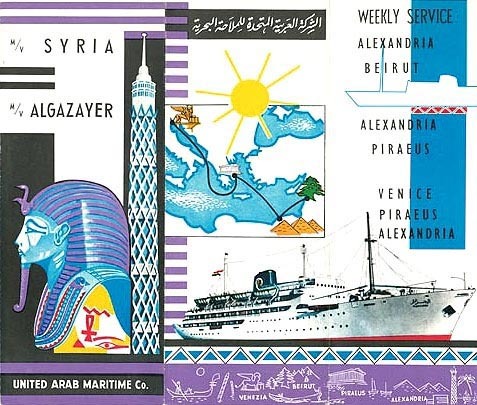 The new fleet was registered under the British flag and operated passenger and cargo services between Alexandria, Constantinople and Syrian ports and between Suez and Red Sea ports. Later services were extended to Piraeus, Malta, Marseilles and Cyprus. P & O Line took control of the company between 1919 and 1924. In 1936 the company was re-formed in Alexandria as Pharaonic Mail Line and in 1941 was changed to Khedivial Mail Line. Services from the Mediterranean to Boston and New York started in 1948 and from 1951 calls were often made at Charleston, Philadelphia and Baltimore. A Port Said – Bombay – Karachi service started in 1953. 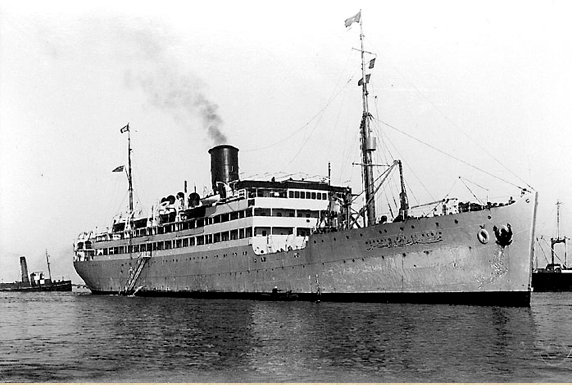 In 1961 all Egyptian shipping lines were nationalized and became part of United Arab Maritime Co. who discontinued New York sailings, but for a time made passenger and cargo sailings to Canada until 1965. From the 1952 Official Steamship Guide. 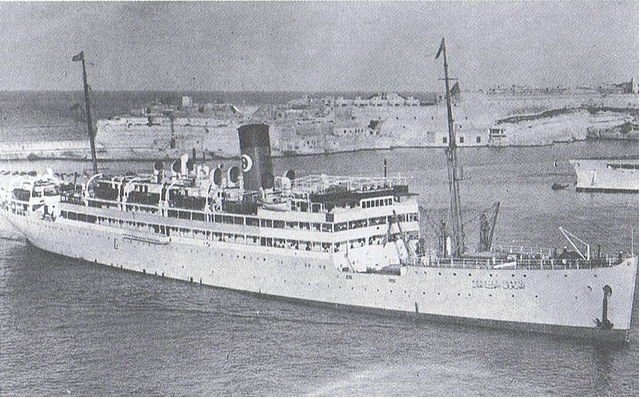 This photograph (copyright unknown) scanned from an old British India handbook shows the ss Khedive Ismail, which as a troopship, was managed by the British India Steam Navigation Company from 1940 until 1944, when she was lost. She was delivered in 1922 by Scotts Shipbuilding & Engineering Co of Greenock as the ‘Aconcagua’ of 7,513 grt, for Compania Sud Americana de Vapores, Valparaiso and served with them until 1935, when she was sold to the Khedivial Mail Steamship & Graving Dock Co Ltd of Alexandria, renamed ‘Khedive Ismail’ and registered in London. In 1940, she was requisitioned by HM Government as a troopship and placed under the management of the British India Steam Navigation Company. As such, she served worldwide, most notably perhaps during the evacuations from Greece in 1941. On the 6th February 1944, she sailed as part of Troop Convoy KR8 from Mombasa to Colombo in company with ‘City of Paris’, ‘Ellenga’, ‘Varsova’ and ‘Ekma’ and was escorted by the Royal Navy cruiser HMS Hawkins together with the destroyers HMSs Paladin and Petard. Embarked in ‘Khedive Ismail’ were a total of 1,511 people, comprising 996 Officers and Men of 301st Regiment, East African Artillery, 290 Royal Navy personnel including 19 WRNS, 54 Nursing Sisters and 1 Matron together with 9 members of the First Aid Nursing Yeomanry plus her own crew of 178 Officers and Men. In the early afternoon of the 12th February 1944, she was torpedoed by the Japanese submarine I-27 and sank inside 2 minutes. Whilst HMS Paladin lowered boats to pick up survivors, HMS Petard commenced a search for the submarine, which was soon picked up on sonar beneath the survivors. As Japanese submarines had a history of machine gunning survivors in the water and for the protection of the remainder of the convoy, the destruction of the submarine was vital and HMS Petard made three depth charge attacks on the submarine, although sadly these attacks in themselves would have killed many of the survivors floundering in the sea. The Japanese submarine was forced to the surface by these attacks and rammed by HMS Paladin, causing considerable damage to herself in the process. Disabled by these attacks, the submarine was eventually torpedoed and sunk by HMS Petard, with just 1 survivor being picked up. Once the chaos of the action had subsided, only 208 men and 6 women survivors of the ‘Khedive Ismail’ remained alive to be picked up and the loss of 1,297 people, including 77 women made this tragedy the third worst British Maritime disaster and the single worst loss of female service personnel in British and Commonwealth history. Previous: American Export Lines: The popular “FOUR ACES” – EXCAMBION, EXETER, EXOCHORDA, and EXCALIBUR.